Those big round eyes! Those fluffy ears! That squishy tummy! Let's face it. Pandas are ... SO CUTE! And, guess what? So is this book! Get ready for cute overload, panda style. And the funny thing is, this panda isn't just cute. It's got attitude! You'll flip over the adorable photos and be equally charmed by what this sassy little panda is thinking and saying on every page. 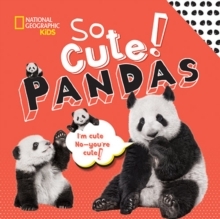 Introducing, the brand-new series from National Geographic Kids that combines two wonderful things: supercute photos of all your favorite fluffy animals and silly text that will have the whole family laughing. Add to that some great nonfiction content that gets kids learning, and, what can we say? This series is just so cute!